Located on the southwest corner of Sixth Avenue and Fillmore Street, 600 Fillmore is a rare example of an American System-Built home designed by Frank LLoyd Wright. 600 Fillmore Street, one of eight known Wright commissions in the state, is the last residential example built in Indiana during Wright's Prairie period. Two additional homes, the K.C. DeRhodes Residence of 1906 and the Ingwald Moe Residence of1909, likewise date from this era. 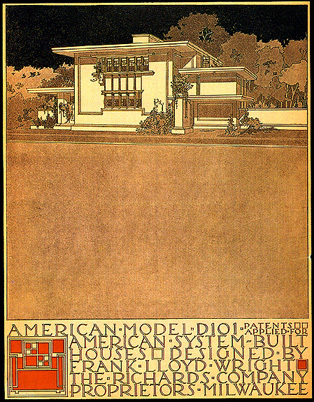 The American System of Housing was a short-lived venture between Frank LLoyd Wright and the Richards Company of Wisconsin. 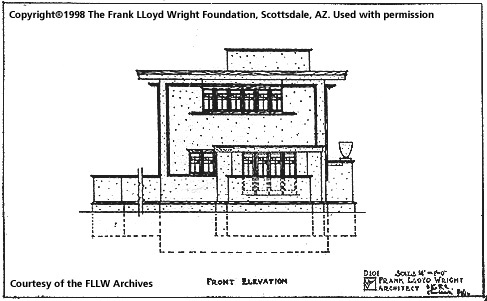 As early as 1911, Frank LLoyd Wright commenced work on various designs which ultimately would become the American System of Housing. 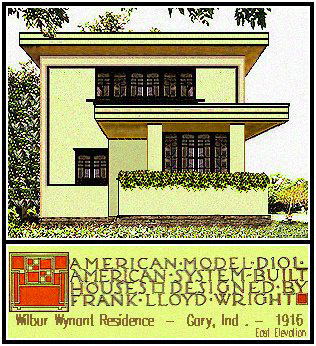 In 1916, Wright teamed up with Arthur L. Richards, a Milwaukee real estate broker and contractor, to provide designs for the American System of Housing. If you are interested in reading a speech given by Wright in 1916 discussing the American System of Housing, please click here. 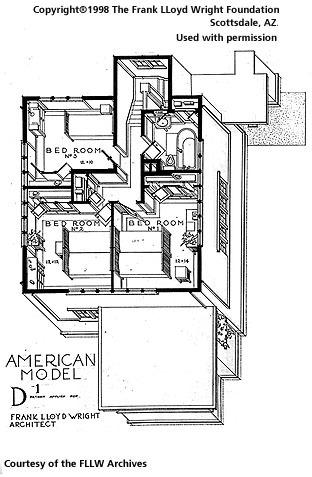 For the American System of Housing, Wright conceived an innovative scheme of construction utilizing a revolutionary two-foot construction module and pre-milled, machine-made materials. The two foot construction module concept, formulated from ideas observed in Japan, permitted the maximum use of standard lumber sizes and allowed for easy variation in a design's plan as called for either by the client or the actual building site. The modules utilized all three dimensions: length, width, and height. Lenght and height are the most critical for this early Wrightian form of modular construction. The two-foot module concept is easily identified throughout the A.S.B. line in each designs' framing, windows, and floor plan layouts. 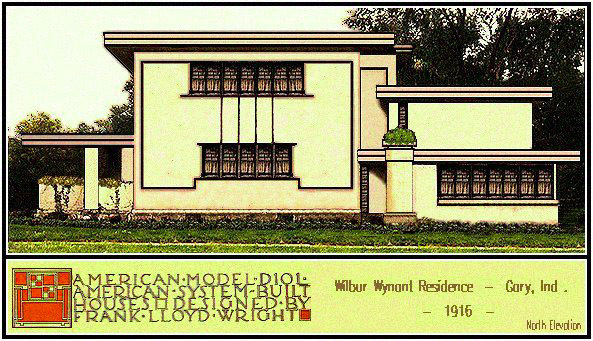 Wright further innovated the A.S.B. line through the use of pre-milled, machine-made materials. The pre-cut materials, such as framing, joists, millwork, cabinets, and doors, were of a "standardized" character which literally permitted the use of these items throughout the A.S.B. line. In addition, as being made by machine, the pre-milled materials were insured to possess an overall consistency, quality, and longevity that on-site carpentry could not achieve. Even more interesting, these materials possess dimensions that are based upon the two-foot increment of the module. Fabrication of the pre-milled, machine-made materials took place in the Wisconsin studios of the Knickerbocker Mill and Lumber Company, a firm organized by the Richards Company. These materials, even though being of a pre-milled character, still needed skilled craftsmen for assembly. The Richards Company controlled sales and construction of Wright's designs by creating a system of unique local representatives and contractors. Local representatives and contractors were located in the City of Chicago, in Chicago's northern and western suburbs, in Champaign and Decatur, Illinois, in Gary, Indiana, and in Milwaukee, Wisconsin. This system of unique representatives and contractors made the American System of Housing more than simple mail order type housing. This franchise system provided quality, guaranteed designs sold and built only by approved Richards Company representatives and crafts people. A.S.B. designs were sold at a "guaranteed" or fixed price which included labor and materials. Prices ranged, as described in a Chicago Tribune ad from March 1917, "for small homes from $2,730 to $3,500 (and for) larger homes $5,000 to $10,000." Moreover this same advertisement states, "(such homes) can be built for less money than the ordinary house of similar size and materials." 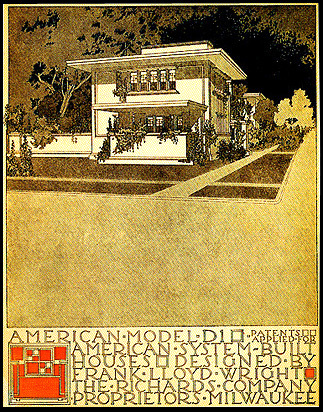 The American System of Housing was additionally advertised as "beauty of utility...an American feeling...an expression of national spirit...fresh, buoyant, vital." 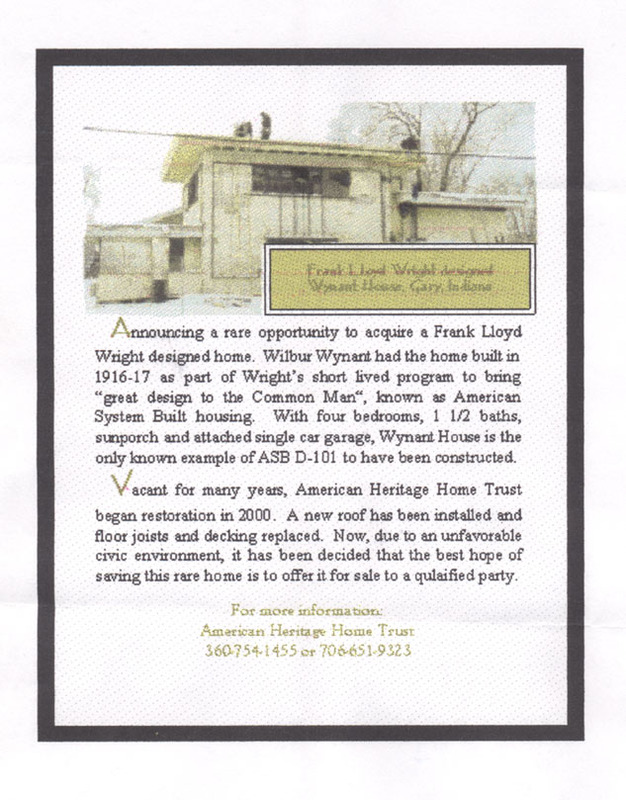 Unfortunately in the spring of 1917, this innovative housing venture between Wright and the Richards Company ended due to America's entry into World War I. The war caused the new housing market to slow down as well as forcing a general reassignment of natural resources to the war effort. 600 Fillmore is a rare example of model D 101: a mid-sized two-story single family dwelling. Model D 101 is a stucco residence possessing a flat roof with projecting eaves, a centrally located chimney, exterior inset banding elements, a front veranda, a rear entryway and garage, and two distinct styles of casement windows. Model D-101 is broken into three primary sections or massings: the front veranda, the central living section, and the garage/maid's quarters. 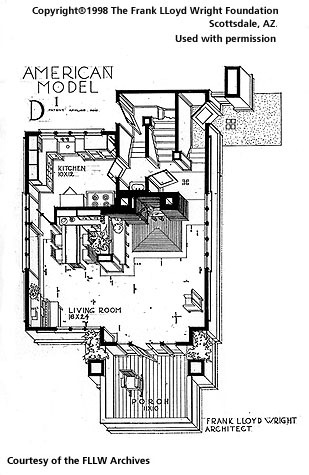 The first floor is defined by a living room with a centrally located fireplace (an established Wright design element), a dining area, a kitchen, and a garage. Model D 101 is noted as having several built-in features on the first floor: an inglenook housed in a partition wall next to the fireplace, a bookcase on the opposite side of the inglenook, an undulating wooden screen to separating the living room from the dining area, and a buffet with an integrated table in the dining area. Located directly behind the front room's fireplace, a dog-legged staircase allows interior circulation to the garage, basement, and second floor. At the top of the first flight of stairs, directly above the garage, is located the maid's quarters. On the second floor, three bed rooms and a bathroom are found. In the bedrooms, Wright specified built-in wardrobes and horizontal pull-out shelving. In addition, model D 101 has a full basement with areas designated for laundry, for the storage of coal, and for the furnace. A concrete retaining wall originally ran along 6th Avenue to separate the garage and yard from the street. In the plans for model D 101, Wright originally envisioned a concrete retaining wall to fully enclose the design's yard. But due to 600 Fillmore's narrow lot, only the 6th Avenue side did possess this feature. Model D 101 illustrates Wright's continued interest and emphasis on the square. 600 Fillmore is an interplay of mass and void being expressed through integrated squares and use of materials. The interplay of mass and void can be viewed in the house's open floor plan, in the subtle decorative muntin separations of the windows, and in the treatment of the exterior facades. "A Fireproof Home for $5,000," running in Ladies' Home Journal in 1906, as seen in the image below, should be noted as the design inspiration or archetype for 600 Fillmore. Note the design similarities between 600 Fillmore and "A Fireproof Home for $5,000." 600 Fillmore was built between 1916 and 1917 for Wilbur and Etta Wynant by the General Construction Company. 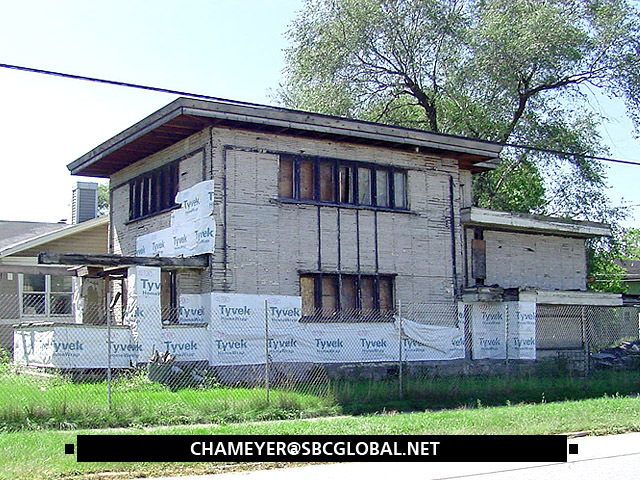 The General Construction Company was the Gary, Indiana American System-Built representative and contractor. This firm's president was Ingwald Moe who additionally lived in a Frank LLoyd Wright design located at 669 Van Buren Street. Mr. Wynant was then president of Gary National Life Insurance Company and Gary National Associates. Click on the two images below to view block prints by Antonin Raymond . 600 Fillmore is the only known extant example of model D 101. Throughout the Midwest, roughly fifteen American System-Built designs still stand; representing seven different model types. During the brief Wright-Richards Company venture, approximately twenty-five A.S.B. homes were constructed. The original twenty-five designs help to illustrate the numerous housing types and variations that were available. A.S.B. housing types included single family cottages, mid-sized single family dwellings, town homes, and multi-family flats. Designs can be found in Wisconsin, Illinois, Indiana, and Iowa. Since I identified this residence as an American System-Built design in the fall of 1995, I have seen much deterioration occur. The past three winters (1996, 1997, 1998) have severally affected the design. Without immediate structural stabilization, 600 Fillmore may not make it through the coming winter. Wynant House is a casualty of location and time. This house reflects what has transpired in Gary and many other urban cores throughout our nation. During the great flight of economic classes from the cities to the suburbs during the 1960s to the 1980s, many historic urban neighborhoods were simply left behind. When driving through the Horace-Mann Neighborhood and specifically the 600 block of Fillmore Street, one can see many holes or "punched out teeth" where houses once stood. Wynant House has been abandoned since the late 1970s. If this design was located in another city or more "affluent" neighborhood, Wynant House probably would have never become so deteriorated or neglected. Likewise, if this house was found in a municipality where historic preservation and urban land conservation policies were enacted, Wynant House probably would have been recognized as an important design and therefore be found in much better condition today. In 1996 after various pleas in Chicagoland newspapers and the Quarterly Newsletter of the Frank Lloyd Wright Building Conservancy, numerous individuals and organizations attended the Lake County, Indiana Tax Sale with the hope to purchase Wynant House for a mere $1,500. When the time arrived for 600 Fillmore to be auctioned, the director of the sale notified the audience that the house was redeemed. After some detective work, I found out that the house was sold prior to the February 8th tax sale. 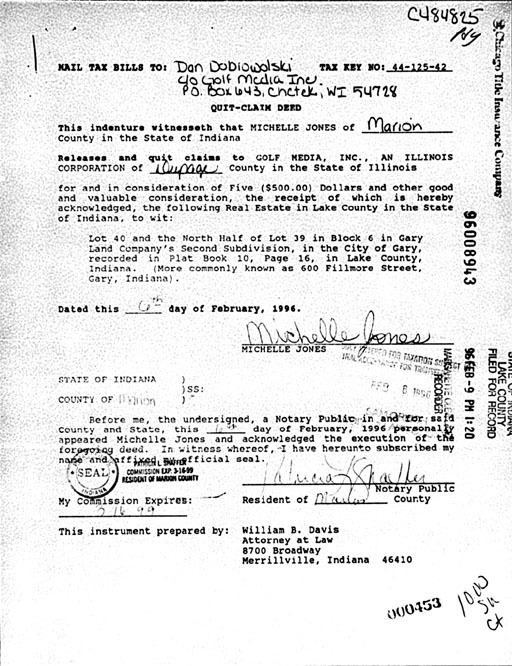 On February 6th, Michelle Jones sold the house to D. Dobrowolski, a Wisconsin businessman, for $500.00, click here to view a copy of the instrument for the sale. Mr. Dobrowolski acquired Wynant House with the intention to rehabilitate the design and to offer it as a luxury Wright rental property. In addition to Wynant House being a casualty of location and time, the house was not universally accepted by preservation agencies. 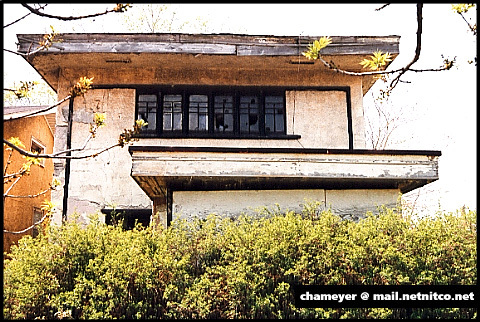 Without receiving the recognition of being an authenticated Wright designed home, Wynant House continued to deteriorate and stand vacant. 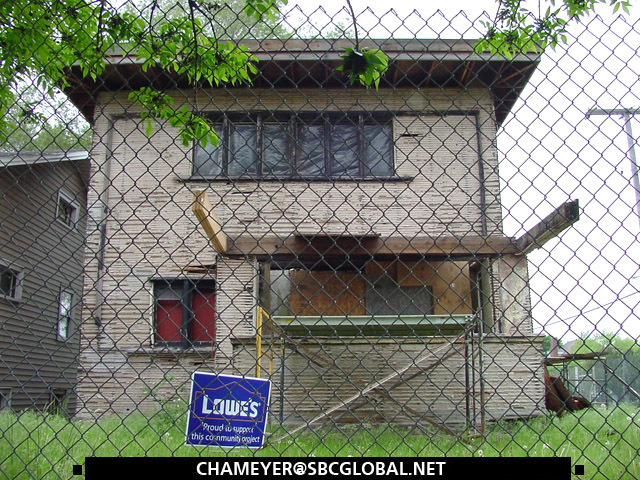 In a May 1996 article by Lee Bey, architecture critic for the Chicago Sun-Times, Karen Kiemnec, Northern Regional Office Director, stated that "the abandoned home is eligible for listing on the National Register but that her agency will let someone else make the recommendation." In addition, Karen Kiemnec continued, "we could recommend (a listing), but we have no plans to do that.....we have occasionally done it in some very special circumstances." When asked if this home "warranted special action" Kiemnec replied ,"I don't know." 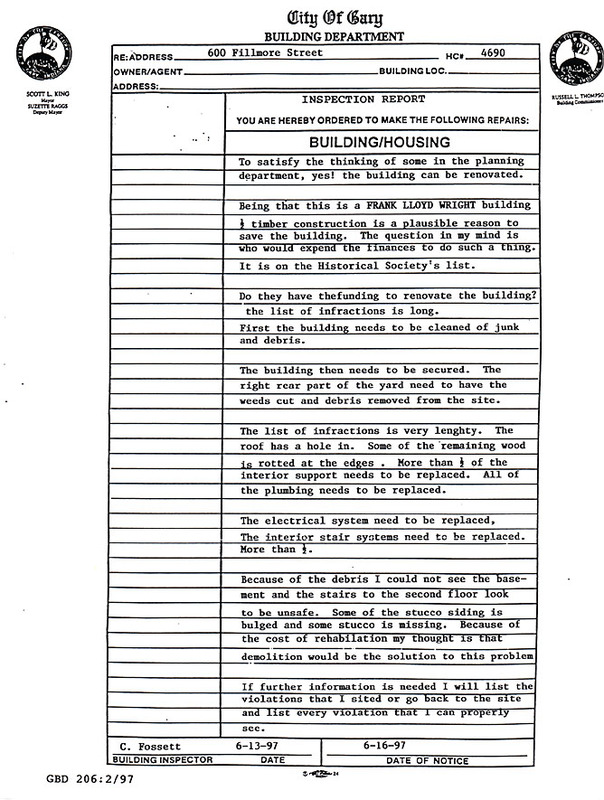 June 13, 1997: A municipal building inspector reviewed Wynant House for infractions of city building code. To access the file, click here. 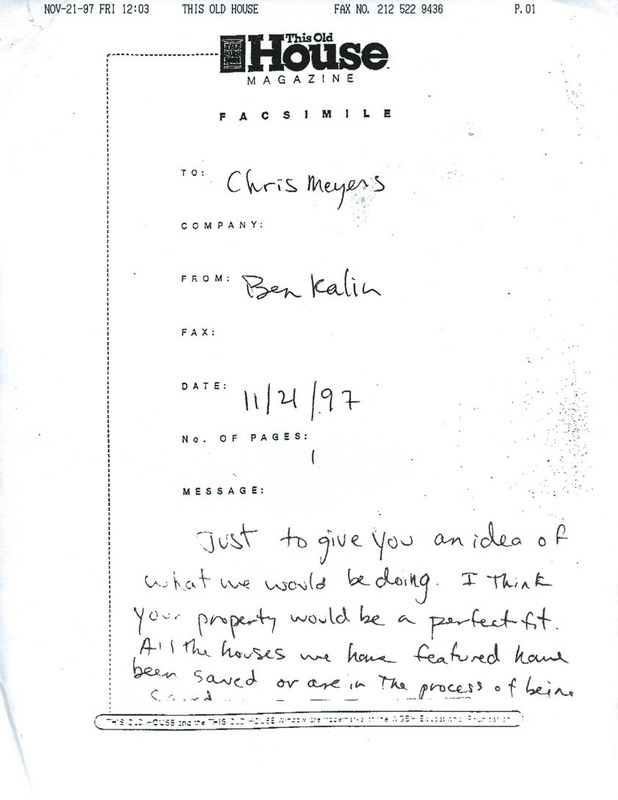 November 21,1997: This afternoon I spoke with Ben Kalin of "This Old House Magazine." Ben discussed with me the possibility of featuring Wynant House in the Save This Old House section of the magazine. He will run this idea through his editors and hopefully we will see Wynant featured in this section. March 15, 1998: I would like to thank Kim Keister of Preservation: The Magazine of the National Trust for Historic Preservation for kindly running a small write-up for 600 Fillmore in the magazine's March - April 1998 "transitions" section. 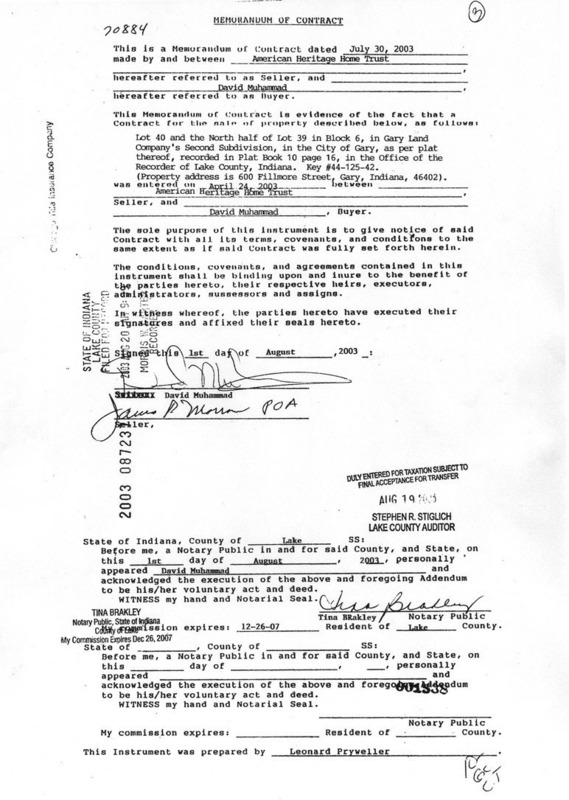 June 24, 1998: The northern regional office of the Historic Landmarks Foundation of Indiana recently acquired deed to the property from D. Dobrowolski. Mr. Dobrowolski sold Wynant House to Historic Landmarks because he could not meet the sizable financial requirements to bring back this design. Todd Zeiger, the Northern Regional Office Director as of March, stated that his organization intends to "clean up, shore up, and stabilize" the design. After stabilization and cleaning, the foundation plans on selling 600 Fillmore to "someone committed to restoring it." February 4, 1999: In an e-mail message, Todd Zeiger informed me "that (Historic Landmarks, the Northern Regional Office) has completed the initial clean out of the interior, removed the debris from the roof, 2nd floor and 1st floor. Hasbrouck, Peterson, Zimoch, & Sirirattumrong of Chicago has been retained to complete a structural study of the property. A temporary roof (tarpaulin) has been installed as has much interior shoring and stabilization." March 1999: In the March issue of American Homestyle & Gardening, 600 Fillmore is featured in a small section called "Bargain House of the Month." The write-up states that this house "includes many of the famed architect's classic Prairie features....but a fire and subsequent water damage has trashed this treasure, leaving it with a partially collapsed roof and no working mechanical systems." The write-up continues denoting the current asking price of $25,000. May 19, 1999: Today I toured the interior of the residence. I can confirm the removal of debris from the structure as well as the construction of a temporary staircase and interior stabilization. Water is continuing to enter the design. I noted several blue tarpaulins covering the roof. These tarpaulins can only provide limited coverage, especially during times of heavy accumulation. I could hear water dripping in several areas: the front veranda, a second floor bedroom, and in the maid's quarters. While inspecting the temporary interior stabilization, I noticed that no lateral bracing had been constructed and that the stabilizing system that has been installed is simply keyed into/bearing load on heavily damaged structural beams. I likewise noticed that the house is not adequately secured: standard municipal board-up material covers the front veranda, side window openings, and doors. Unfortunately anyone can gain entry into the building by simply pulling off these cover-ups. Even though this house requires further shoring and/or stabilization, I congratulate Historic Landmarks on beginning the process. It is difficult and expensive to instantly step in and save a house that is as severely compromised as Wynant House. June 20, 1999: This afternoon I spoke to J. Reid Williamson, President of the Historic Landmarks Foundation of Indiana. During our conversation, I brought to his attention several concerns I had for 600 Fillmore including water infiltration, the state of the temporary interior stabilization, and overall security. Reid stated that he toured the design the week before and that he humbly understood the concerns which I brought up. Reid then added that Landmarks is planning on installing permanent interior framing, a new roof, and improved security. click on the renderings above to see "restored" facade elevations, submitted by Jess M. Giessel. August 1999: I have met with Evelyn Johnson and her daughter, Wendes Jones, to discuss their organization: American Heritage Home Trust (AHHT). AHHT, an Olympia, Washington based not-for-profit, is interested in Wynant House and making this design its first portfolio rental home. During this meeting we toured the home and discussed probable rehabilitation options. 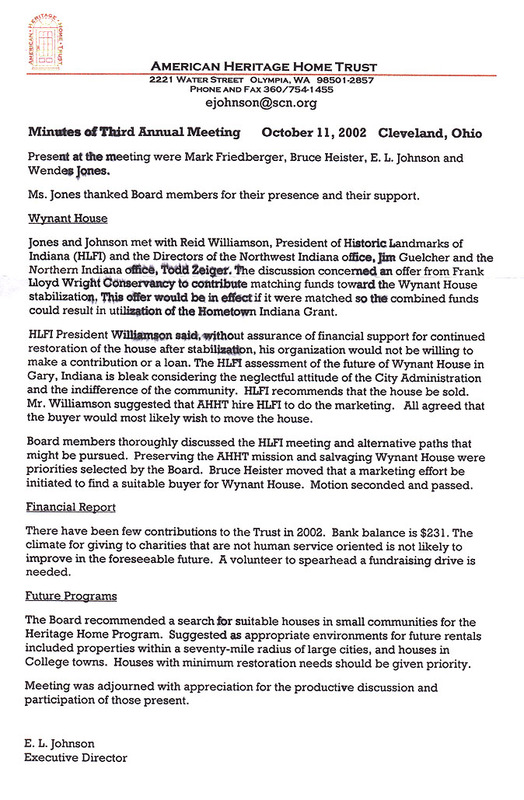 October 1999: I have officially joined American Heritage Home Trust to assist with the acquisition of Wynant House. An agreement has been made that if this organization purchases this design, I will take on the duties of Project Manager. December 20, 1999: American Heritage Home Trust has entered into agreement with the Historic Landmarks Foundation to purchase 600 Fillmore. American Heritage Home Trust intends to rehabilitate Wynant House and permanently maintain this example as a functional Prairie School residence. The house will be rented to cultural tourists for a week or longer. In addition, the house will be available to the community as a focal point for meetings, exhibits, tours and related functions. Moreover, Project Manager has secure John Eifler as Project Architect. John Eifler is credited with working on nearly a dozen other Wright designs. January 13, 2000: This afternoon I spoke to Jon Smith and Steve Kennedy, Indiana Department of Natural Resources - Division of Historic Preservation & Archaeology. I informed each individual of the endangered status of Wynant House. During this telephone conversation, I inquired if the State of Indiana could provide funding for this important rehabilitation. Steve Kennedy informed me that Wynant House could possibly obtain funding under the Hometown Indiana Grant Program. February 22. 2000: American Heritage Home Trust today officially acquired title to the property. The organization paid $27,000 for this 84 yr old design. Protective covenants and conditions for property reversion have been placed on Wynant House, including a two year time frame to stabilize and rehabilitate. During an evening reception at World Beat Cafe & Bar to celebrate the closing, J. Reid Williamson of Historic Landmarks Foundation presented American Heritage Home Trust with a grant for $30,000. This grant, which was obtained from the Indianapolis-based Efroymson Fund, is to assist with the reconstruction of the roof and must be used before the end of the year. 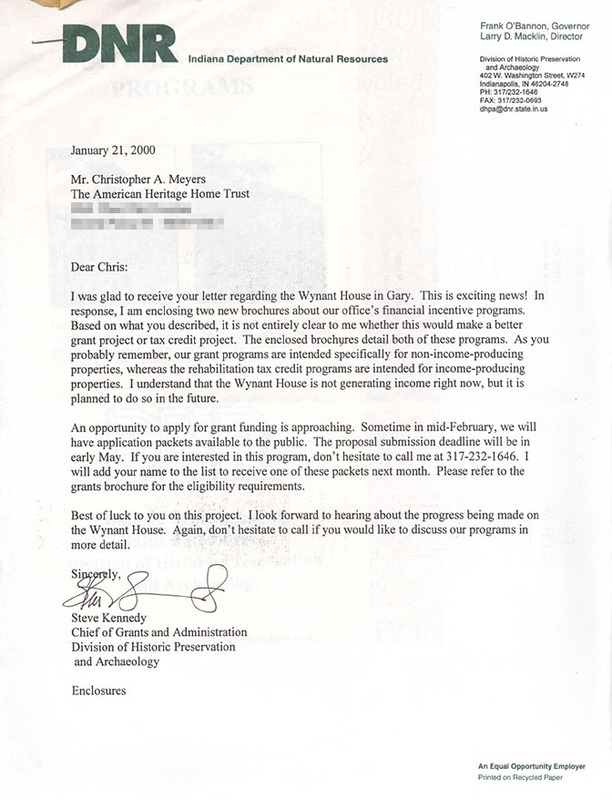 April 24, 2000: If you are interested in viewing current exterior conditions taken by Wynant House Project Manager for a recently submitted grant application , please click here to see a contact sheet of exterior details. To view a current interior shot of the living room, click here. May 2000: Project Manager has secured a donation of a plat survey from D.L.Z., Inc. In addition, Charles Prewitt has been hired to clean up the site and to oversee the installation of perimeter security fencing. 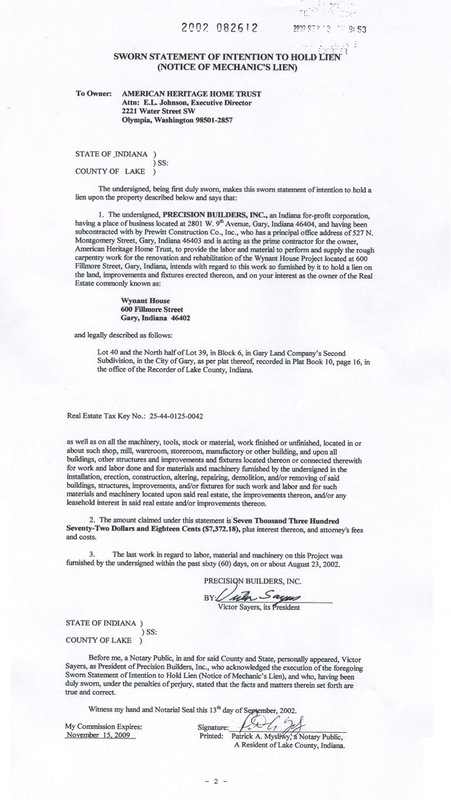 July 2, 2000: American Heritage Home Trust has prepared a bid request for "Phase One." This first stage of work is scheduled to begin in late August or early September. Caliber of work includes: stabilization through the replacement of missing or damaged structural members, squaring up of the exterior envelope, chimney restoration, and roof reconstruction. Work on "Phase One" will be completed before the end of the year. To assist with the rehabilitation effort, the Trust is having an evening fund-raiser on August 7th. This event will take place at the Miller Bakery Cafe; a local restaurant which is well known and highly recommended for its unique, nouveau american cuisine. 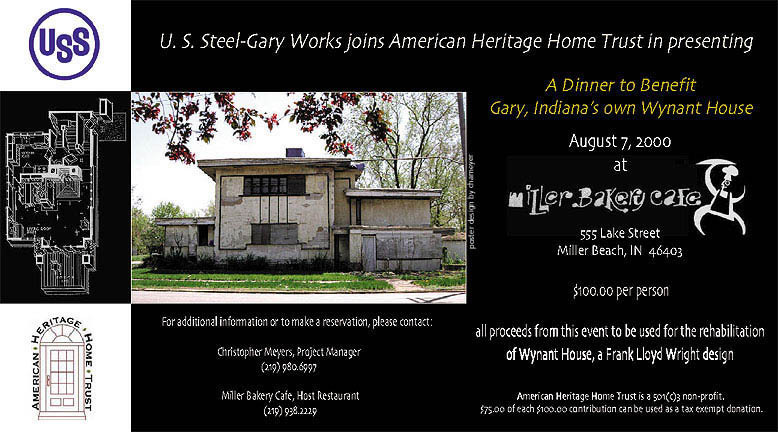 U.S. Steel-Gary Works is co-sponsoring the event. To download an e-poster for this fund-raiser, click here. August 8, 2000: The evening fund-raiser organized by Wynant House Project Manager was a great success with local politicians, business leaders, university representatives, environmentalists, and art-related figures attending. Earlier in the day, an opening reception took place at the Gallery for Contemporary Art, Indiana University Northwest. Click here to see a short virtual tour of the exhibition. The show will remain in the Contemporary Gallery until August 21st. Later in the afternoon, Wynant House Project Manager presented an on-site tour of the exterior. This on-site visit was then followed by the evening fund-raiser. August 9, 2000: This afternoon Wynant House Project Manager secured a pivotal donation from Korellis Roofing, Inc. Korellis Roofing will offer American Heritage Home Trust a significant donation in the form of roofing materials and labor. Without this donation, the future of Wynant House would be in question. 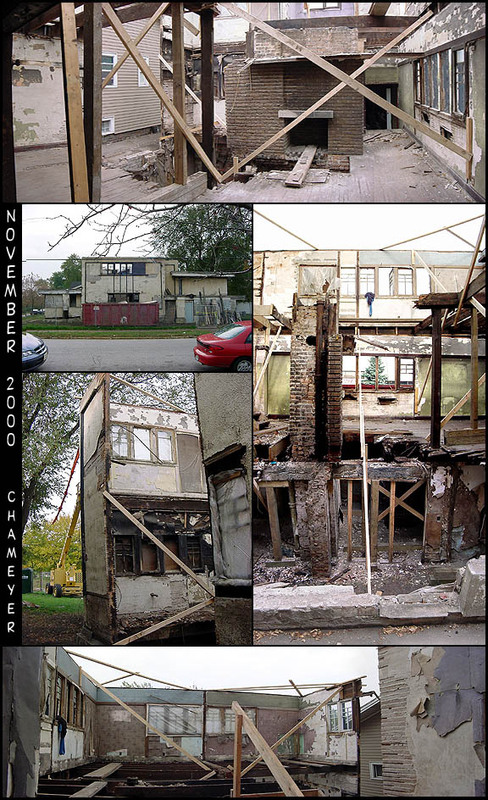 August 20th 2000: To view a virtual "restoration" of the northern exterior envelope, click here. The exterior restoration gif is 4mbs large. Do consider that by downloading this file your internet connection may noticeably slow down and may take several minutes to download this selection. September 2000: The Directorate of American Heritage Home Trust has selected Prewitt Construction as the Project General Contractor and Sam Guard as Project Volunteer. 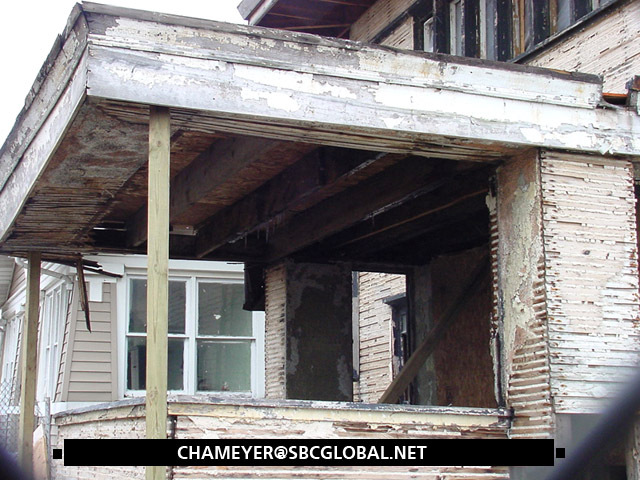 Charles Prewitt is a Gary based contractor who has overseen numerous new and rehabilitation projects in the city. Sam Guard, a Chicago resident, is known for his lecture series at the Chicago Architecture Foundation, Alfonso Ianelli research and documentation, and construction quality assurance services. 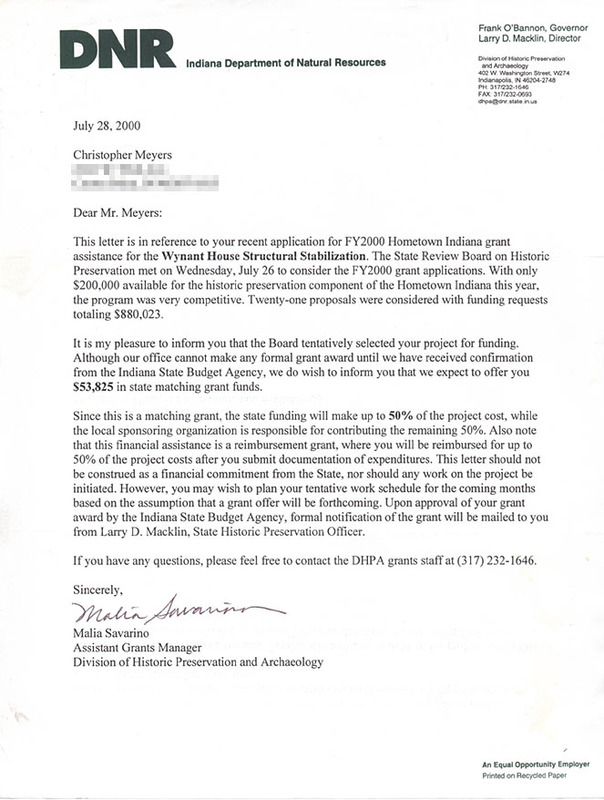 September 14, 2000: Wynant House has been awarded a $53,872 matching grant from the Department of Natural Resources - Division of Historic Preservation & Archaeology's Hometown Indiana Program. This grant is to be used to stabilize the structure and to repair the roof. This is the second grant American Heritage Home Trust has received for the roof. Earlier in the year, the organization receive a $30,000 grant from the Efroymson Fund. No work has yet been realized on the roof. With the approach of Winter and the end of the regular construction season, one is curious to find out what will actually happen with this building. September 18, 2000: Project manager leaves his position with American Heritage Home Trust. October 12, 2000: Work on deconstructing the roof has begun. A portion of the second-story roof has been removed and temporary bracing of the floor and wall systems has been erected. 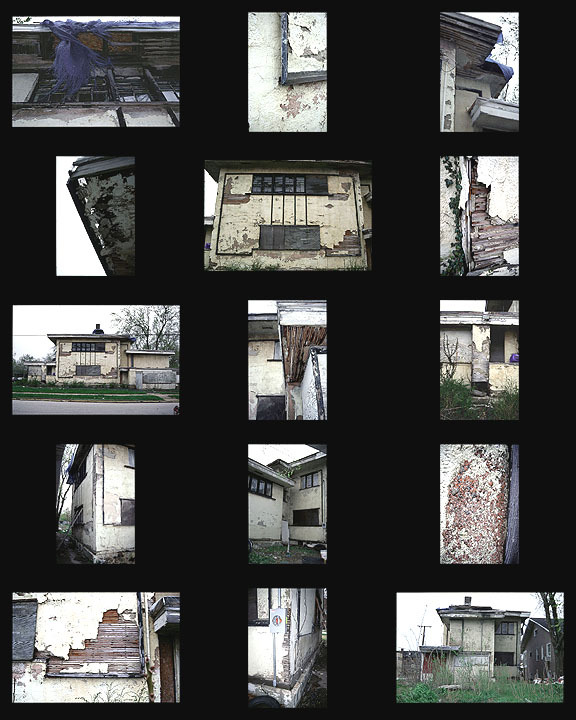 Click here to see a contact sheet of current conditions and a vignette of work being performed. November 1, 2000: dwell Magazine features Wynant House as one of "ten bold homes in unexpected cites" ("There is Too a There There") in its December issue. For a pdf file of this article courtesy of dwell Magazine, double click here. An e-zine of dwell magazine can be accessed via the web at www.dwellmag.com. November 10, 2000: Work has continued on the house. The roof over the central living section has been completely removed. The central living section has no protection from the elements as no replacement roof or temporary covering has been installed. Since the last update, Northwest Indiana has experienced several fall storms and its first freeze cycle. Do remember that water infiltration is the primary reason why this house has experienced so much deterioration, water entry should be halted at all costs. In addition to the removal of the roof, the second floor has been entirely torn out. Only a small section of original second floor fabric remains: floor joists in the southeast section of the house. While removing the central living section's roof, the southern exterior envelope was damaged and/or failed. In order to halt additional structural failure and to save the exterior envelope, approximately 40% of the central living section's southern wall has been cut out. This recently removed section is five casement windows wide and stretches two stories from the ground-level applied concrete stylobate to the roof soffit. To see a contact sheet of recent work, click here. 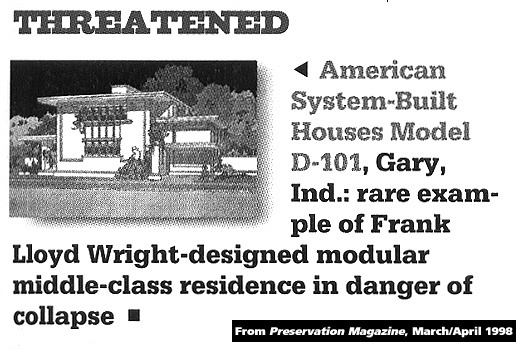 November 11, 2000: This evening in an special segment on ABC 7 News called "Making It Wright," Wynant House was featured as one of several endangered Wright properties. This special segment which was written by Kevin Roy states that many of Wright's designs were not properly engineered, possessed design flaws, and were not sufficiently designed for the environment in which they are located. Project architect, John Eifler, stated that "(Wynant House) is probably the most decrepit building he has ever worked on." Also during this same interview, Wendes Jones, American Heritage Home Trust President and Wynant House Project Investigator, stated that this house is "very close to being lost and that would be a crime." Visit ABC 7 News' web site for a full transcript of "Making It Wright." December 5, 2000: Today new studs and joists have been installed in the southern wall envelope (this is the area where 40% of the envelope was cut out). This two-story section of the house will possess platform framing. In addition, all extant historic interior floor and wall beams have been removed. This has been done as to accommodate new construction. December 12, 2000: Wynant House's interior floor systems have been rebuilt. The new first and second floors are constructed with laminate beams, 2x8 joists, and m.d.f. subflooring. The interior of the house is now of a hybrid construction. New joists are keyed into the original ribbon let-ins and studs from Wright's balloon frame scheme and into the new platform framing. In addition, new interior wall framing has been constructed on the second floor for roof support; this element runs above one of the house's main longitudinal beams. With the new floor systems and partial wall framing in place, Korellis Roofing has been able to commence work on the new roof. The roof should be completed sometime in the week. December 19, 2000: The new roof has been installed. It appears that clear tarpaulins are covering the roof sheathing as the winter weather has halted the installation of the rubber roof. Click here to see imagery of current work. 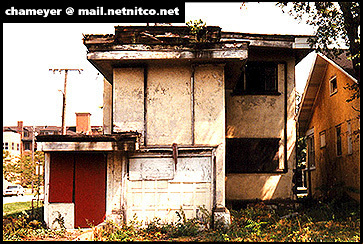 Spring 2001: The house has sat untouched since winter and the end of the recent funding cycle. While passing the residence, I have noticed a large grouping of building materials sitting outside of the western entry. This pile of materials has been exposed to the elements for two seasons. I have noticed various structural members, millwork, and windows simply propped up against the building's facade. As being exposed to the weather for two seasons, the probability that these materials can be reused is highly unlikely. In other news, Mrs. Johnson, Chief Executive Officer of American Home Trust, has arranged numerous public lectures in Chicago and Northwest Indiana to discuss Wynant House. At these lectures, Mrs. Johnson has discussed the history of the home and the attempt by American Heritage Home Trust to rebuild this important residence. During each lecture, Mrs. Johnson has also asked for financial and material donations to assist Phase II of the project. Phase II is scheduled to address the building's exterior envelope. All existing stucco, concrete, windows, doors, and millwork will be removed and replaced with new, historically similar materials. Fanning Howey & Associates, a Michigan City based architectural firm, have donated their time to create a landscape plan. Mr. Monberg is in charge of this relandscaping effort. Summer - Fall 2001: The house remains untouched. The exterior stucco is turning a jaundiced yellow. 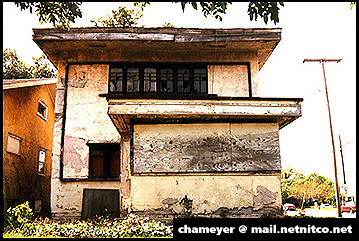 Summer 2002: Signs of continuing deterioration are apparent. The exterior stucco and wooden trim, representing a handful of remaining original materials, are rotting away and falling off the house. If work is not recommenced soon, the entire house will be compromised; thus allowing only for a future reconstruction. Likewise, no work has been performed on the front veranda or rear garage and servant's quarters. These two areas are crucial as water is continuing to enter the house through each of these damaged sections. October 2002: At the annual meeting of American Heritage Home Trust's Executive Board, Evelyn Johnson explained that "there have been few contributions to the Trust (A.H.H.T.) in 2002" and that "the bank balance is $231.00." In an unprecedented move, specifically due to very limited funds and lack of progress, the Executive Board "moved that a marketing effort be initiated to find a suitable buyer for Wynant House (with)...all agreeing that the buyer would most likely wish to move the house." Moreover, the Executive Board was informed that the future of Wynant House "is bleak considering the neglectful attitude of the City Administration and the indifference of the community." Click here to see a the complete minutes of this meeting. Fall 2002: A case for a mechanic's lien has been submitted against Wynant House and American Hertiage Home Trust. This case targets work that has been performed on the house under the Hometown Indiana Grant. Work done under this grant program that has not received full payment includes demolition, rebuilding of the interior framing (in a modified western platform manner), and certain roof features. Summer/Fall 2003: Wynant House is once again on the market. A.H.H.T. has released marketing materials stating that "due to an unfavorable civic environment, it has been decided that the best hope of saving this rare home is to offer it for sale to a qualified party." Sale price is set at a minimum of $50,000, price negotiable. Click here to see a copy of this marketing flyer. 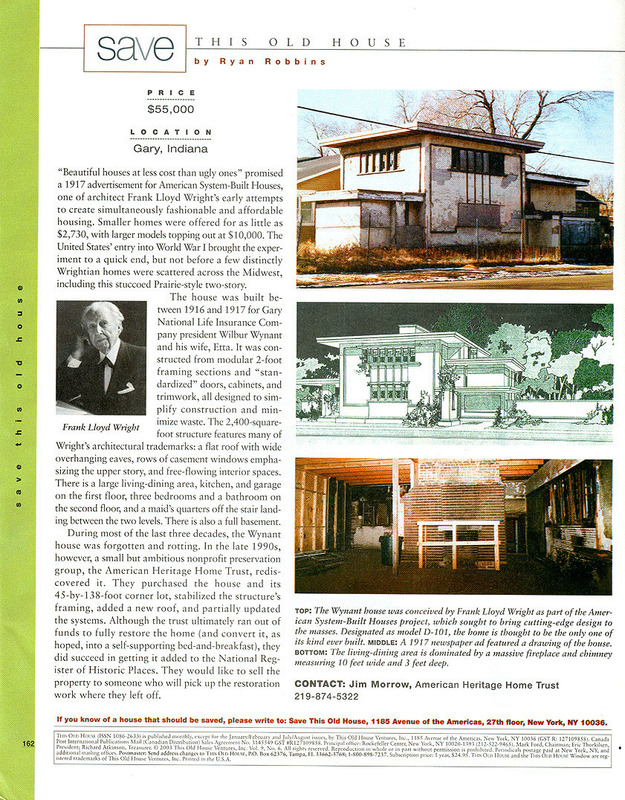 July 2003: Wynant House has been featured in the SaveThis Old House section of "This Old House Magazine. "The house is listed for $55,000 and the article reiterates much of the information from this web site. On July 30th, the mechanic's lien against American Heritage Home Trust has been released. 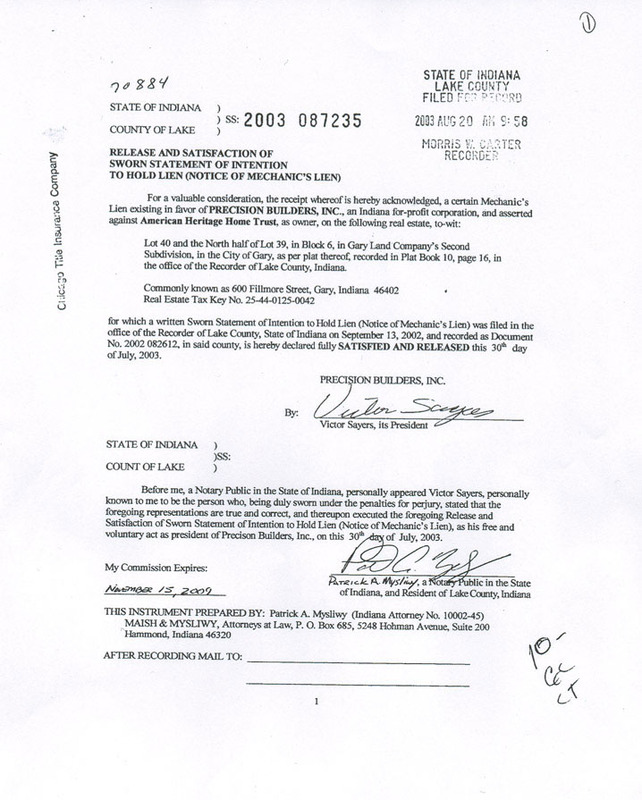 August 19, 2003: In a recently recorded "Memorandum of Contract," Wynant House has again changed ownership. American Heritage Home Trust has sold the residence for an unrevealed amount to David Muhammad of Olympia Fields, Illinois. Mr. Muhammad intends to start up his own construction company and to repair Wynant House. In a recent Post-Tribune article by Carolina Procter, Mr. Muhammad intends to make Wynant House "look as close as possible to the original and make it available to the public." Wynant House will become "a museum, a weekend cottage, or some other type of tourist attraction...with (Muhammad's) first priority to give the home curb appeal by landscaping, replacing missing windows, and removing the fence." Muhammad continued stating that exterior renovations will make people say "wow" while the interior of the house "will still be a mystery." Wynant House will evetually be brought back to life both "inside and out" through Mr. Muhammad's willingness of "spending six figures" on the house. September 23, 2003: Work has recommenced at Wynant House. Workers have removed the building's exterior stucco. 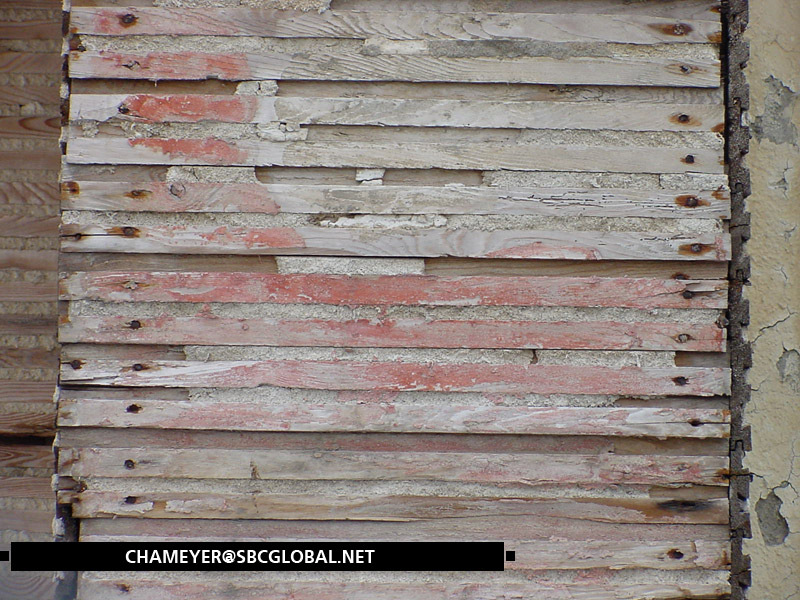 The stucco has been chipped off down to the unique tongue and groove board or "sheathing lath" from which it hung, see attached photos. With Fall and Winter weather arriving soon, it is crucial to replace this stucco skin as quick as possible as this material acts as a moisture barrier. With the tongue and groove sheathing currently exposed, additional damage can occur if the replacement of the stucco is not readily addressed. 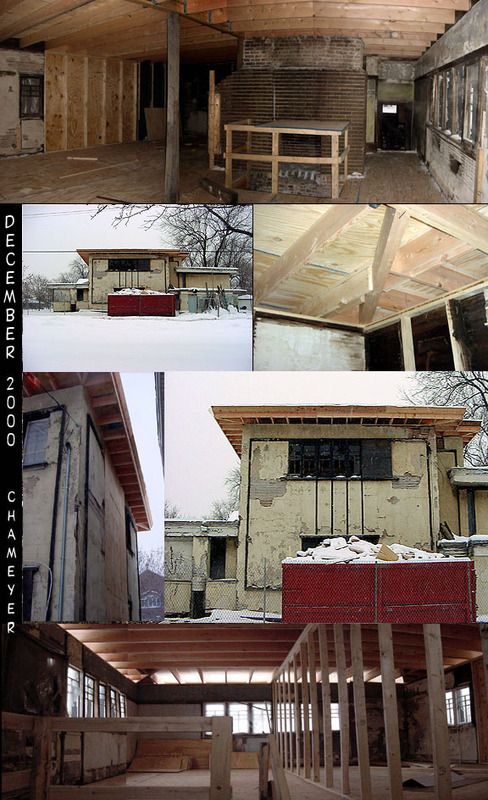 January 10, 2004: The exterior envelope remains open to the elements with no stucco replacement or cover up being installed. Sporadic work has been performed inside the house: exterior board-up has been removed from the windows, some floor decking has been removed, and the front veranda has been shored up. 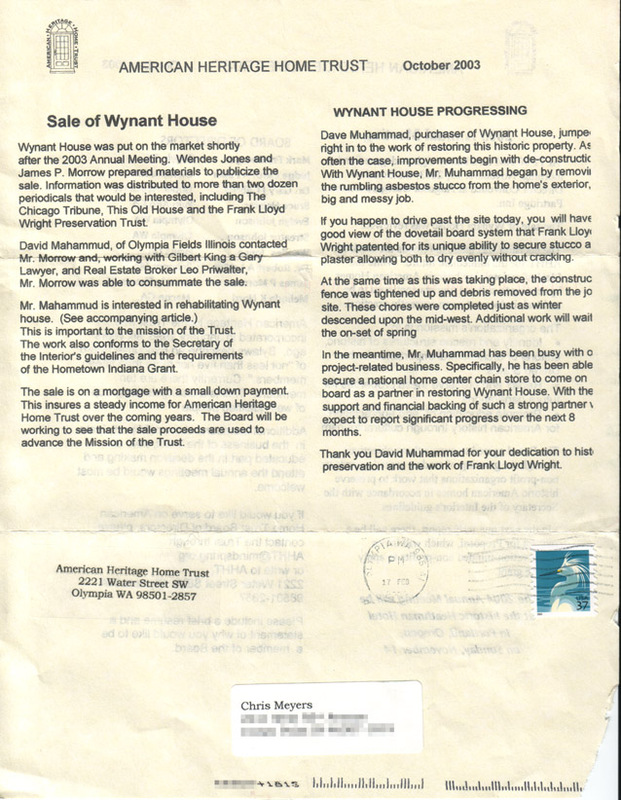 February 20, 2004: American Heritage Home Trust has sent out a quarterly newsletter, dated October 2003, revealing the details of the sale of Wynant House. "The sale is on a mortgage with a small down payment. This insures a steady income for American Heritage Home Trust over the coming years. The Board will be working to see that the sale proceeds are used to advance the Mission of the Trust." Moreover, this newsletter discusses the progress of work at Wynant House. In the article entitled, "Wynant House Progressing," Dave Muhammad has begun the task of restoring Wynant House by "the de-construction...of the (c)rumbing asbestos stucco." It is interesting to note that according to Wright's drawings and a 1995 stucco analysis that this exterior element was strictly composed of a three-layer application of lime mortar. The author of the newsletter, continued with the update saying that "additional work will wait until the on-set of spring and that Mr. Muhammad has been able to secure (an undisclosed) national home center chain store to come on board as a partner." "With the support and financial backing of (this undisclosed) partner, we (American Heritage Home Trust) expect to report significant progress over the next 8 months." Click here to see this October 2003 newsletter. March 10, 2004: Wynant House was featured in a WTTW special entitled, "South of Chicago: Suburbs, Steel Mills, and Shoreline." Check out WTTW's web site to view other Northwest Indiana architectural resources highlighted or to order the special. 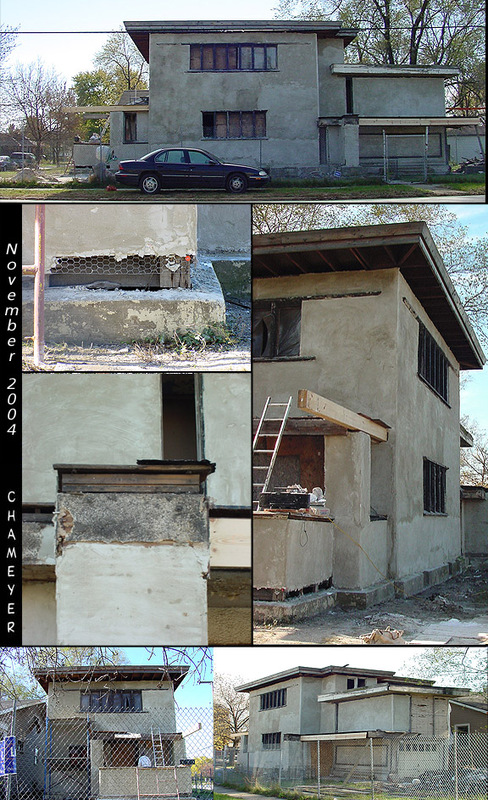 March 17, 2004: Nearly seven months after removing the stucco, the exterior envelope continues to remain untouched or protected. The sheathing lath has turned a jaundiced yellow with chinked material spalling out. Demolition work has likewise continued with the removal of the front veranda's enclosure (non-original casement style windows) and the replacement of the veranda's roof decking. While walking around the perimeter of the house, it appears that the deflection of the house, due primarily to water infiltration and foundation problems, has once again begun to accelerate. In 2000, the project team determined that house deflected almost 6 inches on the southeast corner. As four years have now past, it would be interesting to determine the current rate of deflection. May 24, 2004: Demolition and reconstruction work has continued on the front veranda since the last update. The entire front porch roof has been removed and is in the initial phase of being rebuilt. The "undisclosed national home center" reported in February is now revealed: Lowe's. Signs have been posted in the yard. In addition to work on the front veranda, all openings have been boarded up. 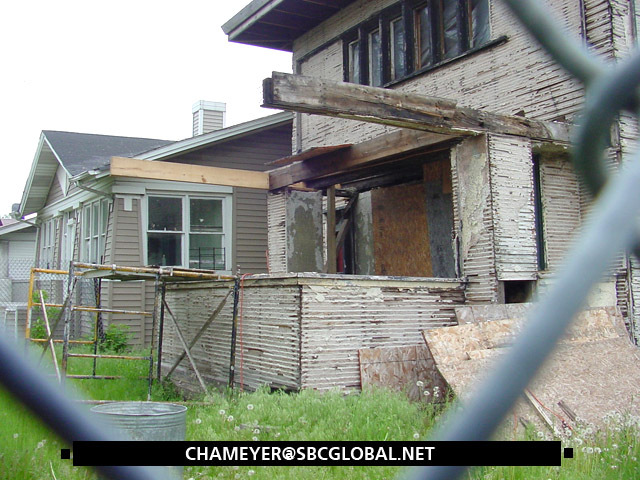 September 2004: After a year of exposure to the elements, the exterior envelope has been partially wrapped in tyvek. This wrap has been applied to the lower portion of three sides of the house, essentially protecting one-third of the exterior. When viewing this recent development, one would ponder...when will the entire exterior be completely wrapped? November 7, 2004: Work has one again recommenced at Wynant House since the last update. The exterior envelope is now receiving a new stucco application. Several envelope-related items have not been addressed prior to exterior stucco work being performed: 1.) required foundation repair work (without this repair being undertaken, the house will continue to skew and rack to the south and east), 2.) the house has not been jacked back into being plumb (if the house is ever brought back into being plumb, any work previously performed will be affected and will need to be repaired, modified, or redone, i.e. future cracking of exterior stucco or replacement members no longer properly connecting) and 3.) the tyvek wrap has not been applied to the entire envelope. In addition, when examing the new stucco, I have notated the following conditions: 1.) the stucco is being hung from chicken wire and not from Wright's unique tongue and groove board or "sheathing lath," and 2.) the replacement stucco is nearly smooth and possesses no marble-chip aggregate as Wright's original. Click here to see a contact see of the recent work. January 9, 2006: Overnight a fire gutted Wynant House. The enitre roof system, the front veranda, and interior are all gone. The house has shifted to the south and is nearly ready to collapse. February 6, 2006: According to national news coverage, current owner, David Muhammad states that he "doubts insurance will cover rebuilding costs. We are definately going to rebuild. Whatever insurance doesn't cover, we're going to add on." 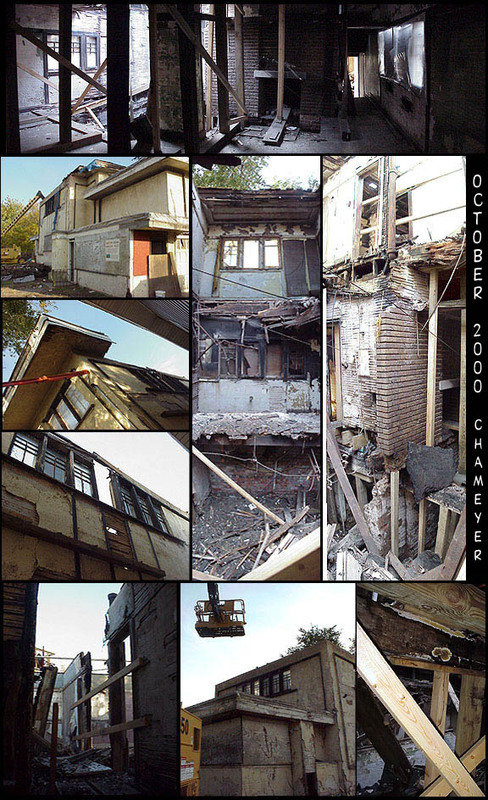 March 9, 2009: After sitting fire-damaged and having no stablization work performed, Wynant House was razed by the City of Gary, Department of Redevelopment. The house was demolished as it was a public safety hazard. With the demolition of Wynant House, the long battle to save this unique residence is now unfortunately over. 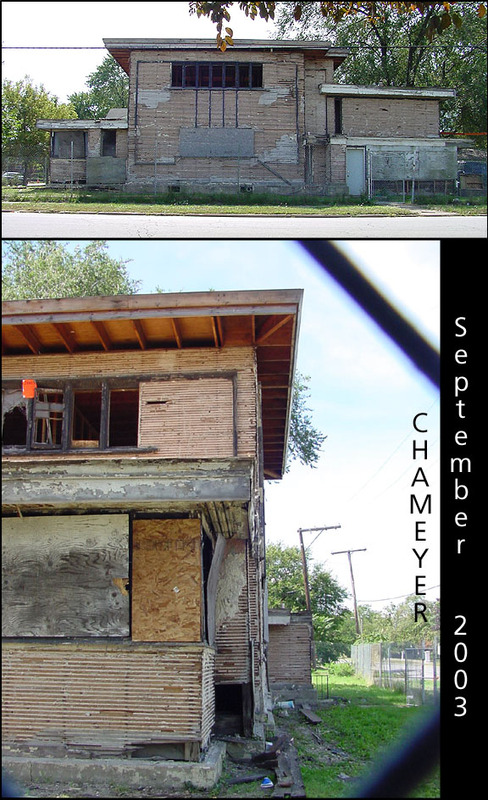 The City of Gary has lost another significant piece of its architectural and cultural heritage. What would Frank Lloyd Wright think of all of this, I would like to know someday??? 600 Fillmore has received an opus number of 1506 (general A.S.B. opus number). The Archives at Taliesin West possess a complete set of architectural drawings for this model. 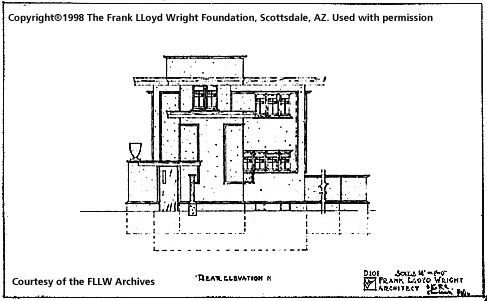 Please note that all elevation drawings used in this web page bear copyrights from the Frank LLoyd Wright Foundation, used here with permission. 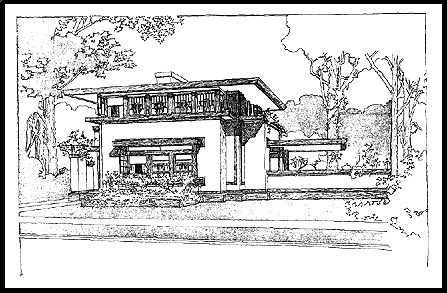 Click on the images below to see the three main elevations as envisioned by Wright and as constructed. 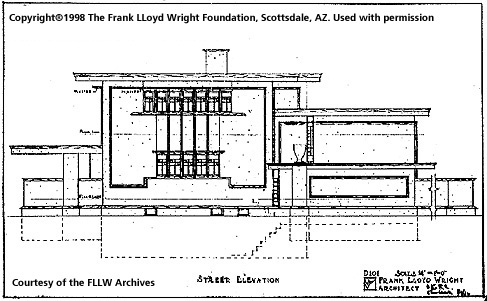 To conclude, the American System of Housing is a greatly unrecognized and forgotten tier of the work of Frank LLoyd Wright. Numerous examples of this innovative housing system have been lost over the past two decades; thereby compromising in-depth future studies, preservation, and architectural recognition. 600 Fillmore embodies a preservation battle call for the remaining A.S.B. designs and the forgotten historic architecture of Gary.